The farcical challenges of class F! 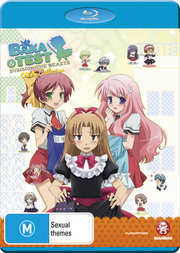 Class F is back in the Baka and Test - Summon the Beasts: OVA Special Collection! Fumizuki Academy's popular Refreshing Festival is quickly approaching, and the student body is busy prepping class projects. For Yoshii and the gang, there's a lot more at stake than showing off for campus visitors. If Class F doesn't profit from its festival project and buy some new gear for its dumpy room, Mizuki's parents are going to send her to another school! Of course, even if the slack pack makes some money, they'll have to win one of the toughest Summoner Test Wars of their lives before they're allowed to spend it. It's not going to be easy, that's for sure. But once the underachievers of Class F get motivated, they don't give up - and they can't even spell surrender! Textless Opening Song "Renai Koujou committee"
Textless Closing Song "Getsuyou wa kirai"